A threat presumes a target; the object of the threat defines the Motivational category of humor. If the perceived target is the immediate safety of the individual then the humor is Emotional. If the target is the feeding turf and resources then it is Feeding. The target of threat of SocioSexual humor is the relationship or the message between sociosexual partners, and Parenting humor sees the individual's offspring, society and the environment as the target. 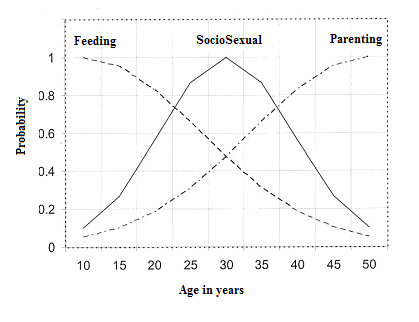 Empirical studies found that emotional humor appealed to all age groups, feeding humor had high preference by the young and gradually falling with age, sociosexual had its peak preference around age 30 falling with the young and old, while parenting humor had steady increase of preference with age. The graphs below show idealized humor age preference. A threat can produce one of two extreme reactions: Either fight or flight. In other words aggression (externalized insecurity) or fear (internalized insecurity). A threat can be falsified either by destroying its credibility (externalizing) or by saving the target of the threat without affecting the threat's status (internalizing). Each motivational category above is divided Cognitively into externalized and internalized extremes, with the possibility of reactions that fall in between. Here are interpretations and examples. Emotional humor, externalized: Self Assuring, falsifying threat to immediate existence, with possible aggressive undertones. Smile, it makes people wonder what you're up to. Why did God create man before woman? He didn't want any advice. Emotional humor, internalized: Liberating, saving self from existing threat, not aggressive. I don't suffer from stress; I am a carrier. If you tell the truth you don't have to remember anything. Feeding humor, externalized: Aggressive, falsifying threats from perceived intruders over feeding turf. I love defenseless animals especially in good gravy. A dwarf wanted to commit suicide so he jumped off the curb. Feeding humor, internalized: Contented, defensive of possessions, self assuring over existing resources. Better the devil you know. Second love is built on experience. SocioSexual humor, externalized: Perceiving threat to relationships without meaningful message, "Nonsense" humor, defeating sender. A stoned went to the airport to receive his father; he kissed the bag and carried his father. Where do Chinese vampires come from? Fanghai. SocioSexual humor, internalized: Preserving meaningful message despite threat, "Affiliative" humor. The telephone rang, the son answered; Is your dad there? Yes said the boy, Do you know who I am? Asked the man on the line, Daad someone on the phone who doesn't know who he is. When I saw my first strand of white I thought I’d dye. Parenting humor, externalized: Anti authority, falsifying fear of the people. UFO's are real; it is the Air Force that doesn't exist. Parenting humor, Internalized: Self-defeating assuring offspring, the young will survive. I was born so ugly the doctor slapped my mother. Humor scores are particularly "noisy", specially when compared with self-assessment personality questionnaires. In order to reduce correlated noise scores are standardized; only comparative scores are calculated. Motivational scores are the cumulative sum of externalized and internalized scores. Cognitive scores are the differences between externalized and internalized sentences. Cross-correlation between personality and cumulative humor appreciation scores was investigated but is not known with differential scores. The main purpose of the new multilingual surveys is to add this knowledge.